I used to think that BB and CC creams were kinda gimmicky - that they wouldn't do any more than a good primer and didn't offer enough coverage to be an alternative to foundation, but I was wrong! The key is finding the right one for you and your skin. If you aren't aware what CC stands for, it's colour corrector, so their function is to correct redness or sallow skin, for example. Again, I thought that a primer would be sufficient but I have found two CC creams to prove me wrong. They are similar in terms of both being CC creams but also quite different in terms of finish and wear time so I want to share my thoughts on both today so that if you want to buy a CC cream for the warmer months, this might help you choose which will work best for you. The two CC creams in question are IT Cosmetics Your Skin But Better CC Cream and Erborian CC cream. How many mls: 45mls in the Erborian CC cream for £38 VS 32mls in the IT Cosmetics CC Cream for £31. Erborian also have a 15ml CC cream available for £17. Texture: The IT Cosmetics one is a creamy liquid and the Erborian is a slightly stiffer liquid that has a mousse-like feel when you start to apply it. Both feel weightless on the skin. Application: The Erborian one works best when applied with fingers. It can be finished with a beauty blender but this isn't necessary. I love to apply the IT Cosmetics one with either a beauty blender or a buffing brush. They both blend into the skin very easily and a streak-free look can be achieved quickly. 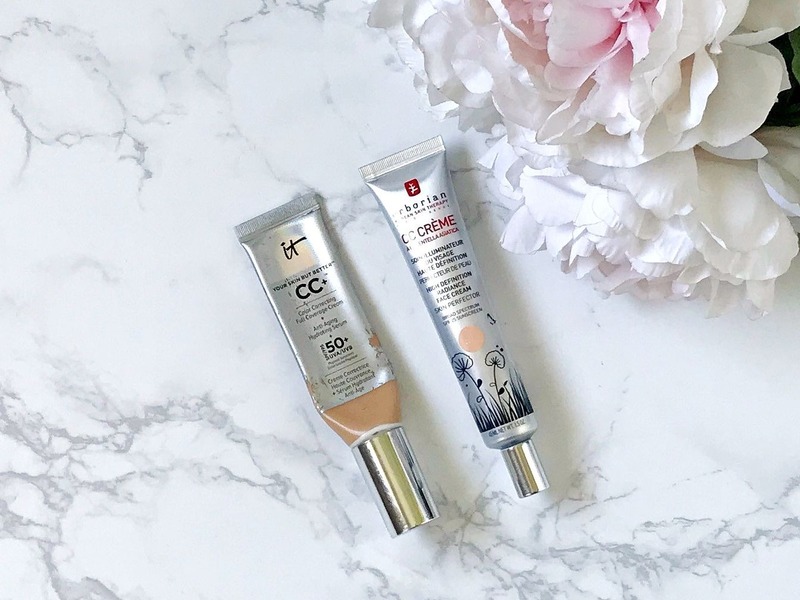 Coverage: The It Cosmetics CC cream offers pretty full coverage and the Erborian one offers light, buildable to light-medium. Finish: The It Cosmetics one has a satin/leaning on dewy finish. It blurs the appearance of pores and fine lines and feels hydrating. It also conceals areas of redness and doesn't settle in any areas of dryness. There is a matte version and also an Illuminating version available. The Erborian CC cream has a luminous finish that makes skin look fresh & healthy. It evens skin tone and glides over pores and fine lines. SPF: IT Cosmetics has SPF 50 and the Erborian one has SPF 25. Wear time: I find that the IT Cosmetics one stays in place until I remove it, so a good 8-10 hours usually, which is pretty impressive. The Erborian one fades on me around the 7 hour mark so I need to touch it up a little bit or add some concealer to refresh. Shade Range: There are 12 shades in the IT Cosmetics whereas there are only 2 shades of Erborian, although it does adapt to your skin tone. Overall thoughts: Which one you buy really depends on the coverage you want. For a very light base, the Erborian one is ideal - I think in summer when you want makeup to look very natural and not to feel heavy, it's perfect. The IT Cosmetics one could be worn on a night out or special occasion because of the coverage and wear time it gives. Both will cover redness and blur pores so it really comes down to coverage preference. There is room for both in my collection as in summer, I always prefer a light base. IT Cosmetics available here. Erborian available here and here. Have you tried either of these? Are you a fan of CC creams? All products are bought by me, unless otherwise stated. The Erborian CC Cream was kindly sent to me. Opinion is always my own. Affiliate links may be used.